Engineers at the University of Maryland, College Park (UMD) have discovered a method to make wood more than ten times tougher and stronger than before; creating a natural substance that is stronger than titanium alloys. 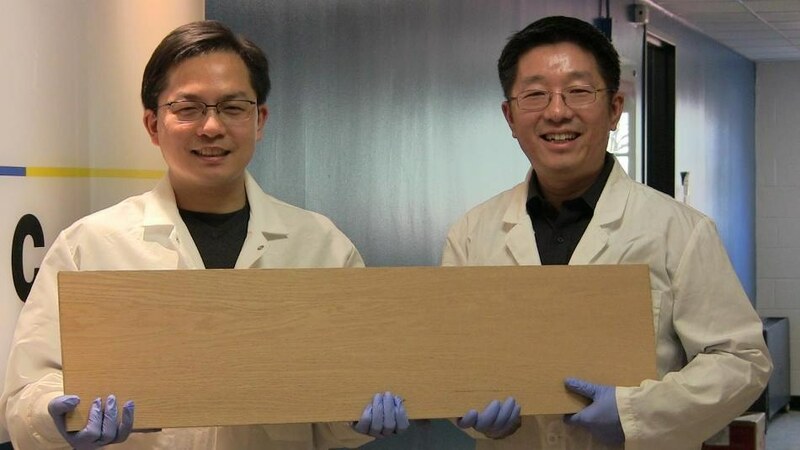 "This new way to treat wood makes it 12 times stronger than natural wood and ten times tougher," said Liangbing Hu of UMD's A. James Clark School of Engineering and the leader of the team that conducted the research. The research is in the February 8, 2018, issue of the journal Nature. This could be a competitor to steel or even titanium alloys; it is so strong and durable. It's also comparable to carbon fiber, but much less expensive. "It is both strong and tough, which is a combination not usually found in nature," said Teng Li (co-leader of the team) and Samuel P. Langley (Associate Professor of mechanical engineering at UMD's Clark School). His team measured the mechanical properties of the dense wood. "It is as strong as steel, but six times lighter. It takes ten times more energy to fracture than natural wood. It can even be bent and molded at the beginning of the process." The researchers also tested the new wood material and natural wood by shooting bullet-like projectiles at them. The projectiles blew straight through the natural wood, whereas they were stopped partway in the fully treated wood. "Softwoods like pine or balsa, which grow fast and are more environmentally friendly, could replace slower-growing but denser woods like teak in furniture or buildings," Hu said. The paper provides a highly promising route to the design of lightweight, high-performance structural materials, with tremendous potential for a broad range of applications where high strength, large toughness, and superior ballistic resistance are desired. It is particularly exciting to note that the method is versatile for various species of wood and fairly easy to implement. "This kind of wood could be used in cars, airplanes, buildings - any application where steel is used," Hu said. "The two-step process reported in this paper achieves exceptionally high strength, much beyond what [is] reported in the literature," said Zhigang Suo, a professor of mechanics and materials at Harvard University, also not involved with the research. "Given the abundance of wood, as well as other cellulose-rich plants, this paper inspires imagination." The most outstanding observation, in my view, is the existence of a limiting concentration of lignin, the glue between wood cells, to maximize the mechanical performance of the densified wood. Too little or too much removal lowers the strength compared to a maximum value achieved at intermediate or partial lignin removal. This finding reveals the subtle balance between hydrogen bonding and the adhesion imparted by such polyphenolic compound. Moreover, of outstanding interest, is the fact that that wood densification leads to both, increased strength and toughness, two properties that usually offset each other. Orlando J. Rojas, Professor - Aalto University, Finland. Hu's research has investigated the capacities of wood's natural nanotechnology. They had previously made several emerging technologies using nanocellulose related materials. Some of these include a paper used to replace plastic, photonic paper for enhancing solar cell efficiency (+30%), a wood supercapacitor and battery, a battery made from a leaf, transparent wood for energy efficient buildings, solar water desalination (to be used for drinking and filtering out harmful dyes). These wood-based emerging technologies are being marketed via a UMD spinoff company, Inventwood LLC.